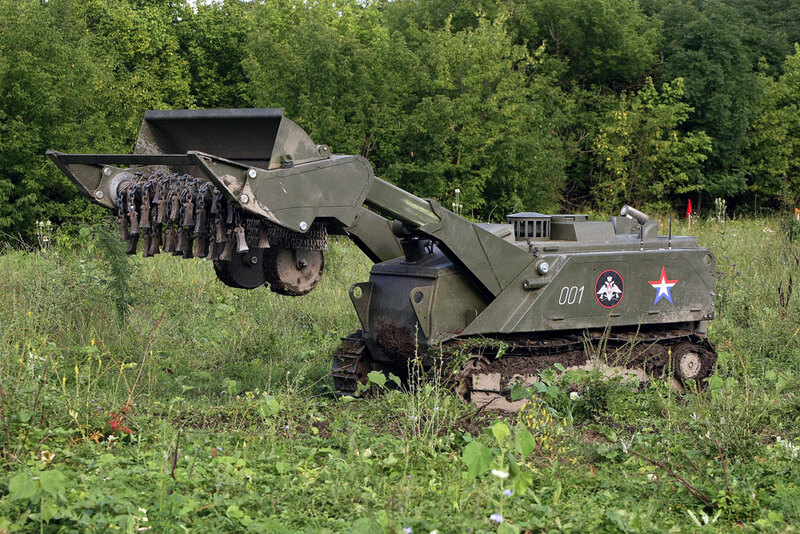 Testing the remote-controlled multirole Uran-6 robotic system, while defusing minefields in Chechnya's Sunzha District. Foreign customers have started to file more applications for Russian-made Sukhoi Su-34 fighter-bombers, the export modification of Kalibr cruise missile systems and Uran mine-clearing robots, the head of the delegation of the Russian state arms exporter Rosoboronexport at the Aero India 2017 exhibition said on Feb. 16. Rosoboronexport delegation Head Sergei Goreslavsky said that the Russian military hardware had proved its worth as "reliable, qualitative and trouble-free weaponry capable of successfully performing missions in real combat conditions." "Naturally, this has been noticed by foreign customers and, correspondingly, the number of inquiries to Rosoboronexport about the types of armaments used in the operation has increased. From among aircraft, customers have displayed interest in multipurpose and combat helicopters, multipurpose fighter jets, fighter-bombers and unmanned aerial vehicles," Goreslavsky said. "Higher interest has been displayed in Club-N and Club-S integrated missile systems [the export modification of Kalibr missiles], as well as in various Russian robotized complexes, including from the Uran family," the Rosoboronexport official said. Russia launched its anti-terror operation in Syria in late September 2015. The operation involved upgraded Su-30SM and Su-35 multipurpose fighter jets, modernized Su-24 frontline bombers and Su-25 attack aircraft, Su-34 fighter-bombers and also deck-based Su-33 and Mikoyan MiG-29K/KUB planes. Besides, Russia used multipurpose and attack helicopters, including Mil Mi-28N and Kamov Ka-52 gunships while drones were employed to reconnoiter and monitor the situation. The strikes against militants in Syria were delivered with Kalibr cruise missiles both by surface ships and submarines of the Russian Navy while the Russian military used Uran robots for mine-clearing operations.